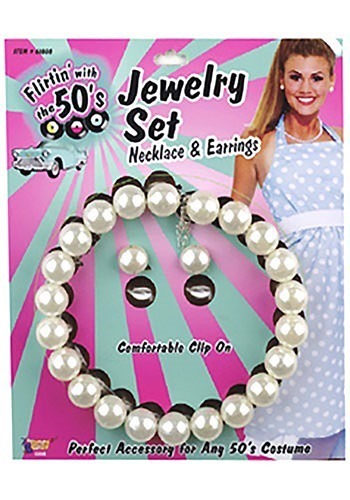 Marc will totally ask you to go steady once he sees you in this 50s Pearl Set Costume Jewelry. Wear it to the next sock hop and show him how classy you can be. Pearls are, after all, the most fashionable thing a woman can wear these days! A classy guy like Marc, of course, is looking for a real lady—someone he can settle down and have a family with, someone he can paint a pick-it fence with, someone he can gather 'round the radio with. And as my mother always says, real women bake a mean, delicious apple pie and always wear fine pearls! So how about you snap this around your neck and show him how ready to paint that fence you are!